After Hours Stamper: What makes an expenisve tool worth the cost? What makes an expenisve tool worth the cost? While we have touched on many various types of products here, we have not yet explored the the big ticket tools yet (this could have something to do with the fact that I can't afford them ; ) Tonight I thought it might be fun to take a look at some expensive tools, what do they do and most importantly, are they worth their cost? Cost: $250 - 300 less with a coupon or special deal. First up, everyone's favorite,the Cricut. No, I do not own one of these, and likely will not be buying one in the future. Why? Because, in my opinion, the cartridges are very expensive, $40 plus on sale. And you have to buy an additional program if you want to use this machine with your computer to do your own designs. 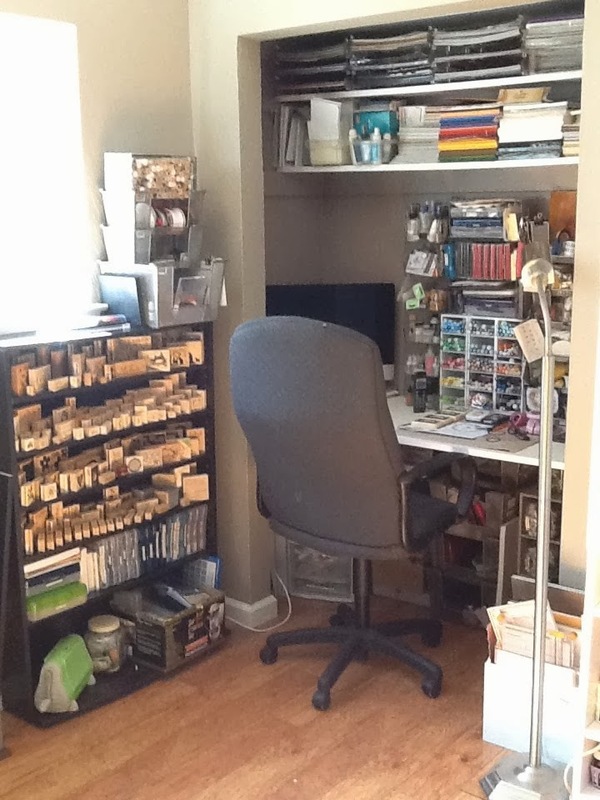 The base price plus the design studio, plus accessories can put you easily over $400. Next up, the Inspiration by Pazzles. Extras for this machine include a tool to hold any pen, an engraving tool, embossing tool, a whole list of accessories that you can buy. The machine comes with 300 images, and it will pretty much cut on anything you might use, including fabric. And you can hook this machine up to your computer and use images you already have, which means you don't have to buy their images or cartridges if you need more die cuts. This machine also embosses, engraves and distresses (from what I could read the Cricut does not do any of these things). 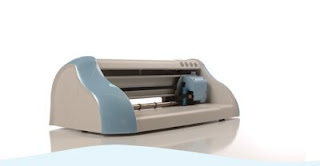 This is a neat idea, a really small, portable cutter, runs on batteries or a cord, and instead of feeding paper into a machine, you place the machine on the paper which enables you to use your paper more efficiently. I like this idea, and they have a kit you can order which will allow you to download any image onto a memory chip that you can then use in their machine. You can also buy a number of memory cards with various patterns, I haven't seen the prices for these cards yet. 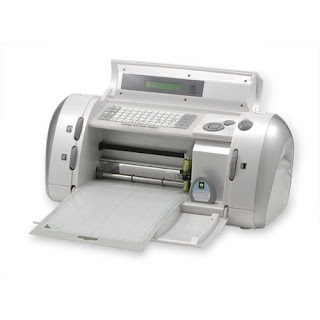 All of these machines offer something a bit different, one can use cartridges and also hook up to your computer, another one can also emboss, engrave and distress, and the last one is portable and runs on batteries. For my money, given my limited budget, I would most likely go for the slice (which also would fit into my little area a whole lot better then the other two machines). 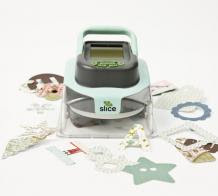 For the price of the slice you can do as much as with the larger cutters, but it takes up far less room and it is portable. What makes all of these tools nice is that they make your crafting so much easier. And if you are making a large number of the same thing, you just set the machine and cut away, which ends up saving you a whole lot of time. Do you have any of these machines (I understand the Slice won't be available until October)? What do you like/not like about them? Would you buy it again? Would you buy something different? Why? The "slice" looks great. What about the "cuddlebug"? I have been looking at that to buy for a while now. The Cuttlebug is a great machine, and with a coupon you can pick one up for less then $50. The difference is that these electronic machines can cut an image in numerous sizes, the cuttlebug dies only cut in one size, for a different size you have to buy a different die. I have a wishblade. got it off of ebay for $150, but they retail for $400 plus. I love it and haven't had to put more money into it yet. I joined the yahoo group wishblade and they share .gps files (i think that is what they are called). It is the same machine as the silloute and the robocut. I use to say myself that I would never buy any of these expensive machines. They were not in my budget, and who needs all those expensive cartridges taking up space. But when WalMart had the Cricut so cheap last year on Black Friday I had my MIL get me one. She works there, so got an additionl discount. I think she paid $112. It came with 2 cartridges. I have since bought 2 more. I bought Fabulous Finds which was on sale for $40. This is a big savings in the long run because I no longer have to spend all the money on metal hardware, I just cut out what I want and emboss it in silver, gold, or whatever metal I am in need of. I also recently bought Paper Pups. Normally this would not be something I would want. And I really only bought it for 1 item on it. But since I have to make a couple hundred cards with a dog bone on it, it is a huge time saver over stamping them and cutting them out. I was unable to find a punch in the right size, so the cartridge was perfect. And it was only $50 including shipping. I think I may find a couple more along the way that I will like, for now I am happy with the 4 I have. There are hundreds of images on those 4. Thousands if you consider all the differnt sizes each one can be.